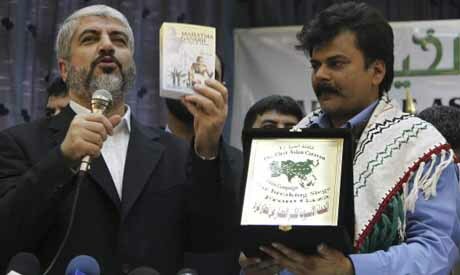 The collaboration of Global March to Jerusalem organisers and supporters with internationally designated terrorist organisations was one of the project’s key elements from its inception. 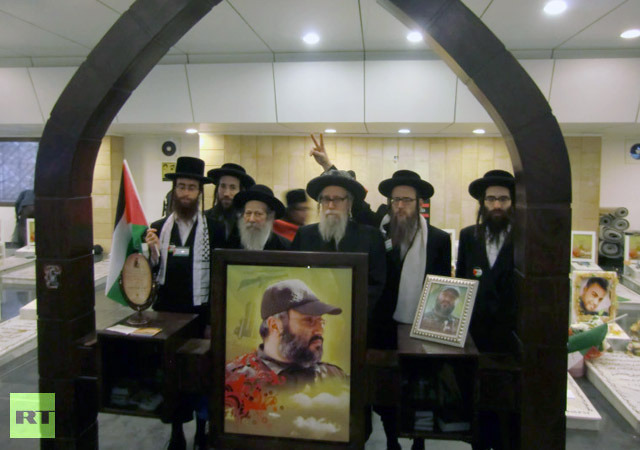 Even so, the spectacle of its Neturei Karta participants in Lebanon paying a visit to the tomb of Hizbollah leader and terrorist Imad Mughniyeh and laying a wreath there has to be one of the more repulsive memories of the event. Mughniyah was, of course, responsible for the deaths of scores of people of many differing nationalities, including citizens of the United States. 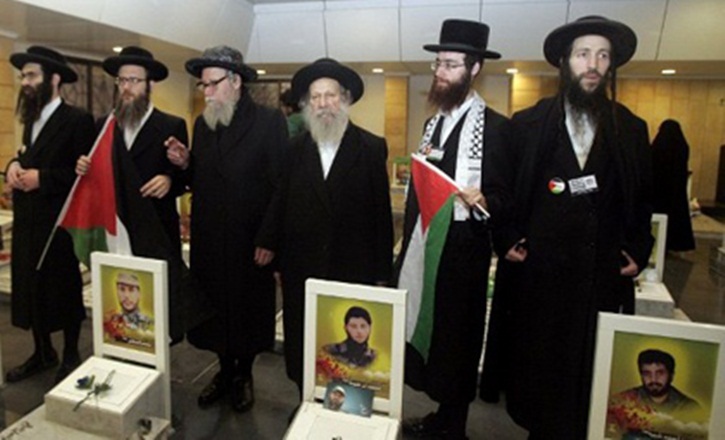 That fact does not apparently preclude presumably US passport-holding members of Neturei Karta such as Yisroel Dovid Weiss from lauding a murderer or rubbing sympathetic shoulders with those who continue his bloody legacy. 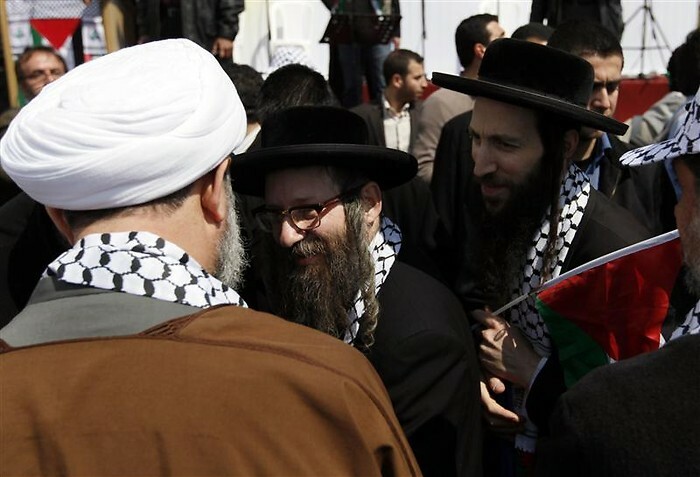 That the miniscule fanatic fringe sect Neturei Karta long since left behind the consensus of common decency by participating in a Holocaust denial conference in Tehran is well-known. Apparently though, their willingness to prostitute themselves to any and every Israel-hater around is not even curbed by respect for their fellow Americans, Canadians and Britons murdered by the various terror organisations with which they collaborate so willingly. 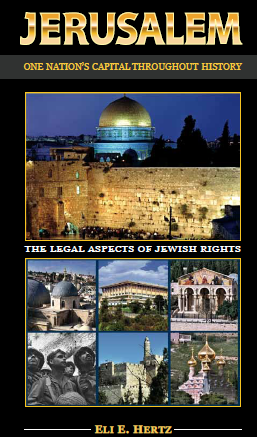 Taking a post-event look at the Global March to Jerusalem, it is as important to identify what did not happen as it is to look at what did occur. The most obvious conclusion is that the GMJ organisers failed to get the numbers of participants they declared having in advance, with only single percentage numbers of their vaunted one to two million marchers actually taking part. Despite GMJ organiser Ribhi Halloum’s feeble attempts at face-saving post-event spin, any objective observer can only conclude that the project’s organisers are clearly out of touch with majority concerns and opinion. This was also reflected in the picture around the world with, for example, a mere 50 activists turning up for the GMJ event in Germany and 100 in Ottawa. 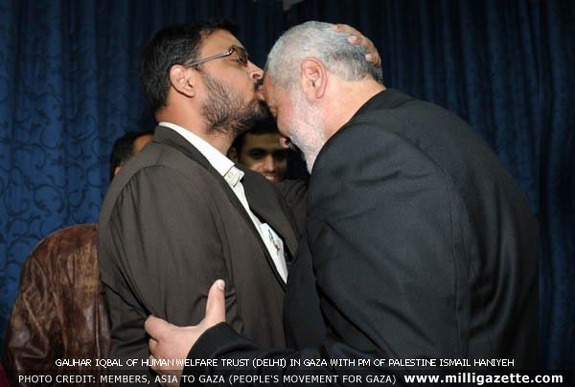 Even in London – a major hub of anti-Israel activism and home to a significant proportion of GMJ organisers and their various organisations – the turnout to shout at an empty Israeli embassy was not particularly impressive. 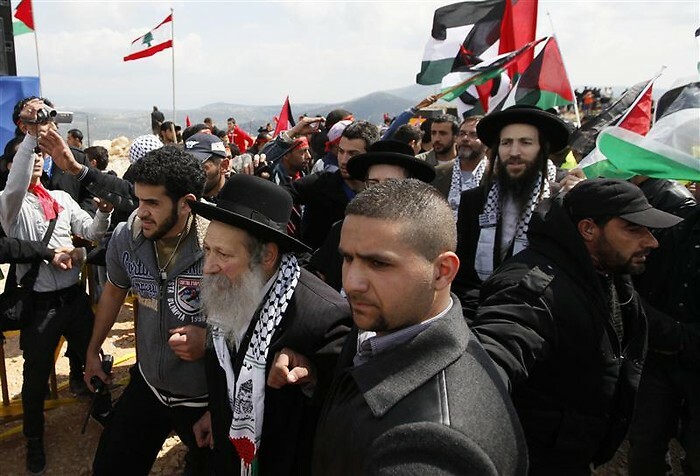 Significantly too, in Deir Hanna – the site of the main Land Day march in Israel – and other locations in the Galilee, participation in the event was low, with organisers already expressing their disappointment on Israeli radio by early Friday afternoon. With the majority of the world’s mainstream media giving the event very low profile handling, it is also clear that the organisers failed to achieve another of their main objectives: the creation of an embarrassing PR event for Israel which would result in condemnatory headlines around the globe and create an opportunity for another Goldstone-style attack on Israel’s legitimacy. That objective was in part thwarted by the actions taken by the authorities in the countries bordering Israel to contain the event to demonstrations and avoid the potentially fatal clashes which would have resulted had they allowed the would-be infiltrators to have their way. In Syria the only GMJ event took place in Damascus, with the Iranian regime’s Press TV reporting that ” the Syrian government prevented them from reaching the nearest point to the Palestinian land, as a result of the accident that happened last year on Nakba Day where Israeli soldiers killed around 26 demonstrators who tried to cross the borders in the action called “Yawm al Awda”. 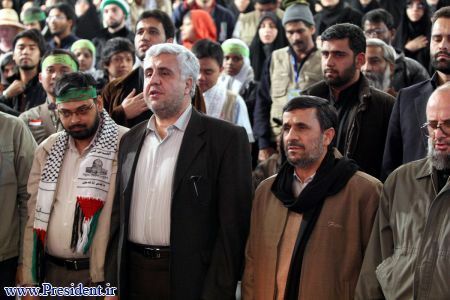 One must also factor in to that decision the rifts which appeared early on among GMJ organisers of a pro-Iranian/Syrian regime persuasion and those loyal to the Muslim Brotherhood which is heavily represented among the Syrian opposition, as the proliferation of Hizballah flags and Assad portraits at the Damascus event reflects. Participation in the GMJ event in Lebanon, which was confined to the Beaufort castle, was reportedly low due to the fact that the Lebanese army declined to allow participants to approach the border. Some foreign activists expressed a clear – but typical – lack of understanding of the regional dynamics at play. 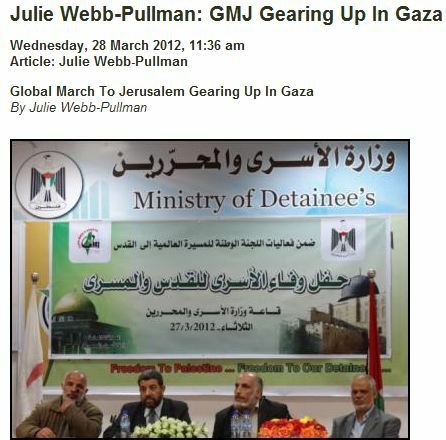 Here’s a GMJ-North America supporter, #Occupy “human rights” activist, and Mondoweiss contributor, Deppen Webber. 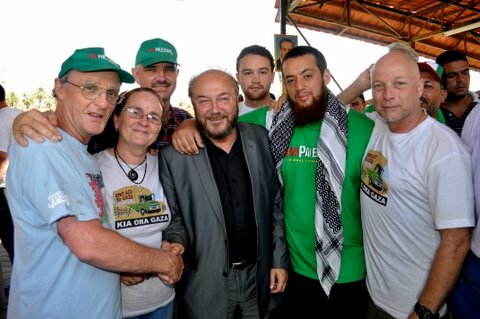 The Global March to Jerusalem has undoubtedly helped shine the light of exposure on several important points, one of which is the unquestioning collaboration between so-called peace activists and human rights advocates from Western and other countries and extremist elements such as Hamas, Islamic Jihad, Hizbollah, the Iranian regime and even the Syrian Nazi Party – SSNP – which was represented at the GMJ event in Lebanon. In addition, it is clear that the professed GMJ slogan of non-violence is merely a tactic employed by this handful of extremists in order to gain sympathy and legitimacy for their cause among Western audiences. 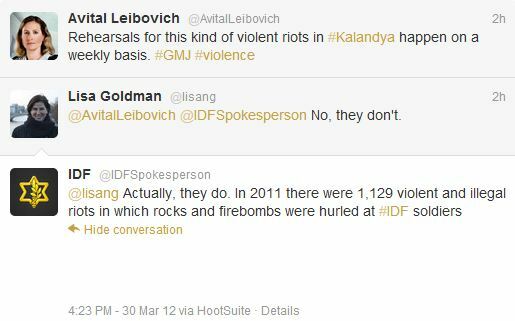 Just as there is nothing non-violent about intending to illegally breach a sovereign state’s borders and over-run its capital, there was nothing non-violent about Friday’s riots in Bethlehem, Gaza and Kalandiya (lead, incidentally, by a professor from the Sorbonne and with approximately 8% of the rioters being foreign activists – probably members of the ISM). 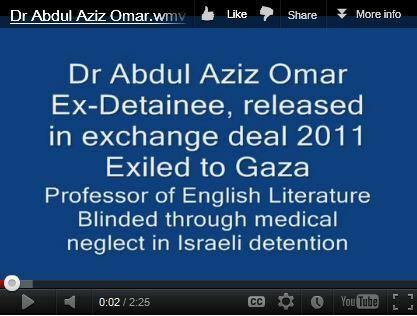 Equally clear is the end-game agenda of the organisers of the Global March to Jerusalem and its supporters. 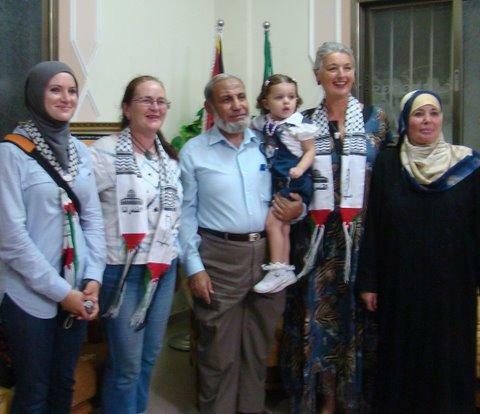 Their common denominator is the rejection of a negotiated two-state solution to the conflict, the rejection of recognition of Israel’s existence and the aspiration of achieving an imposed settlement which would bring that about. The ample rhetoric we have heard over the past few weeks on such subjects as ’64 years of occupation’ and ‘liberating Jerusalem’ is clear indication of their aims. 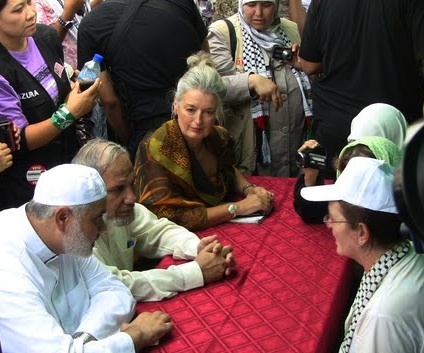 The Global March to Jerusalem project has clarified just how little understanding this bunch of professional and semi-professional activists have of the dynamics of the Middle East as indicated by their indignant objections to the fact that various authorities and security forces acted to prevent the escalation of their provocation into a potentially serious cross-border event. Fortunately, it has also exposed just how out of touch its mostly foreign organisers are with the aims and priorities of people who actually live in the region and how outlandish the ideas of their relatively small – if loud – cult movement are to the majority of the people they seem to have somehow persuaded themselves that they represent. Pro-Palestinian activists involved in the Global March on Jerusalem (GMJ) criticized Israel on Twitter Friday after violent protests along Israel’s borders forced the deployment of tear gas and resulted in injuries—but downplayed the fact that rocks and firebombs had been thrown by protesters to instigate the clashes. 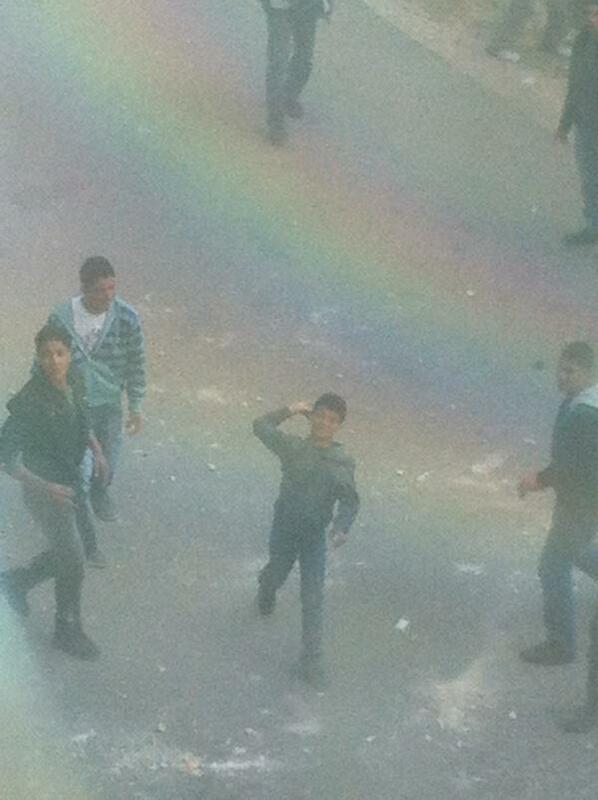 Pictures and videos from the protest—which aims to “end the Apartheid, ethnic cleansing and Judaisation policies affecting the people, land and sanctity of Jerusalem”—reveal that self-described “peaceful” protestors have been throwing firebombs and rocks at Israeli border police. Twitter user Captain Barak Raz, who identifies himself as a spokesperson for the Israeli Defense Force’s division in the West Bank, posted a video of protesters throwing a firebomb at Israeli security forces. 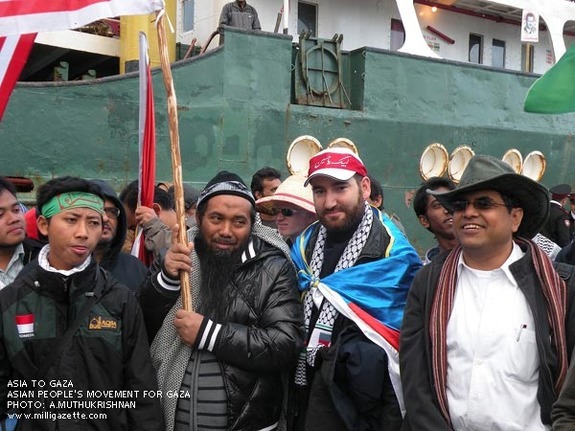 As the SE Asia delegation to the Global March to Jerusalem docked in Tripoli, Lebanon, after a ten-hour ferry ride from Turkey, hints of problems began to emerge. Iraq, and 3 from the Philippines, 37 from India .. Are remaining on board the ship convoy Asian .. And still attempts to obtain visas for them to enter the Lebanese territory ..
A more complete account of the story comes from Kunal Majumder – the Indian journalist travelling with the convoy. “The steamer arrived at the Beirut port early on 28 March carrying the 137 GMJ delegates from 13 countries. None of them were allowed to leave the vessel by the immigration authorities. Immigration officials boarded the steamer and handed out the visa on arrival forms, which once filled were taken away along with the delegates’ passports. After hours of wait, no explanations were given to the delegates for the delay in issuing the visas. As the delegates began to raise slogans in protest on the steamer, the immigration authorities allowed the Indonesian delegates to enter the port once their embassy intervened. Towards the end of the day, with no fresh supplies of food or water, delegates from counties like the United States, Iran, Turkey were allowed to leave the steamer. Interestingly, citizens of these countries do not need a visa to enter Lebanon. 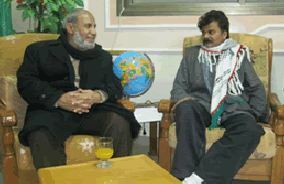 The GMJ’s local contacts had been assured that the delegation would be issued visas on arrival as per norm. 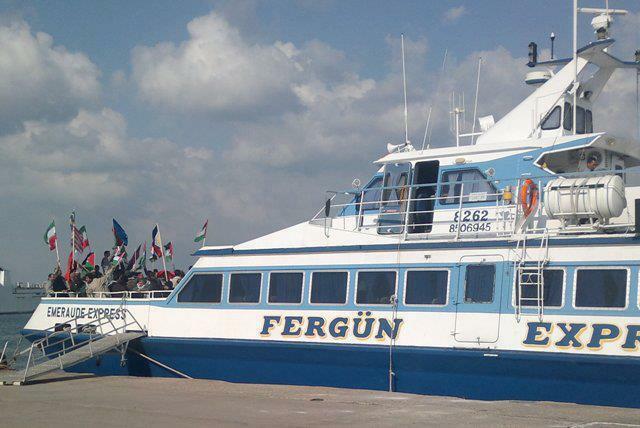 It was on this assurance that the Turkish authorities allowed the delegation to leave its port. 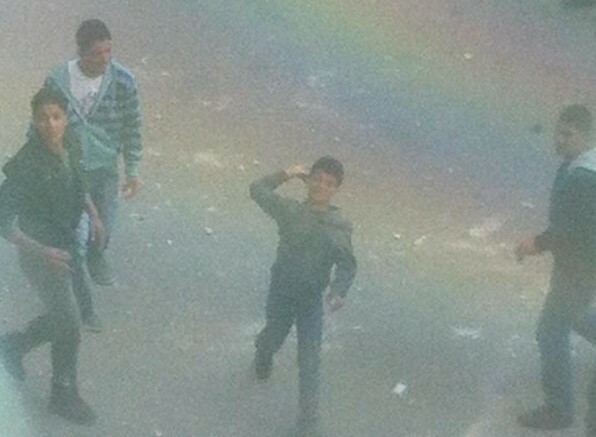 UPDATE: The detainees have apparently now been allowed off the ferry and into Lebanon. 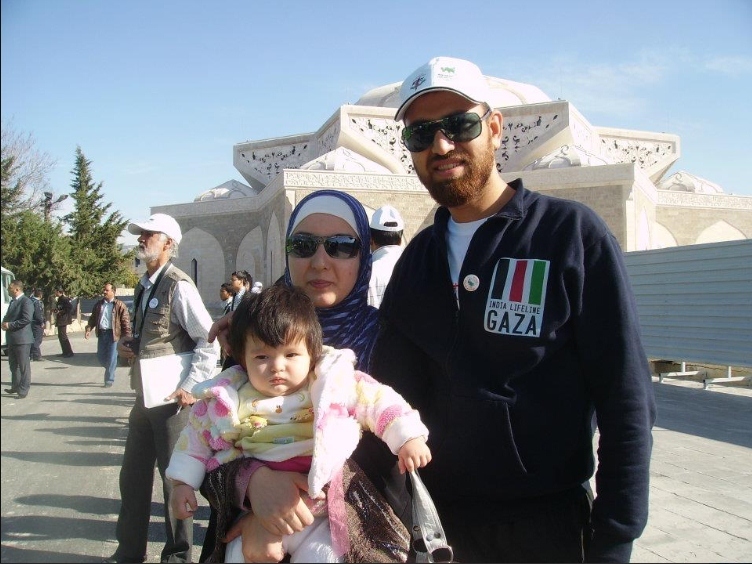 Marusek is a board member of the Palestine Civil Rights Campaign-Lebanon (PCRC), an activist with the ‘Right to Return Committee –Lebanon’ , the ISM and ‘Viva Palestina Arabia’. Marusek’s willingness to collaborate with a TV station run by an Islamist fundamentalist terror group is in keeping with her other role as political analyst for Press TV – run by the Iranian regime. Here is Marusek in an interview from March 5th, expanding on the same theme of the American government “groveling”, “bowing to AIPAC” and claiming that the US President’s “loyalty lies with a foreign state”.